As a tree service company, we have been serving the Northern Virginia and Maryland community for over fifty years. Growing Earth Tree Care has been recognized over the years for our exceptional tree preservation services for both commercial and residential clients. As evidence of our quality, roughly 60 percent of our employees are certified by the International Society of Arboriculture. For reference, this percentage is one of the very highest in the country. 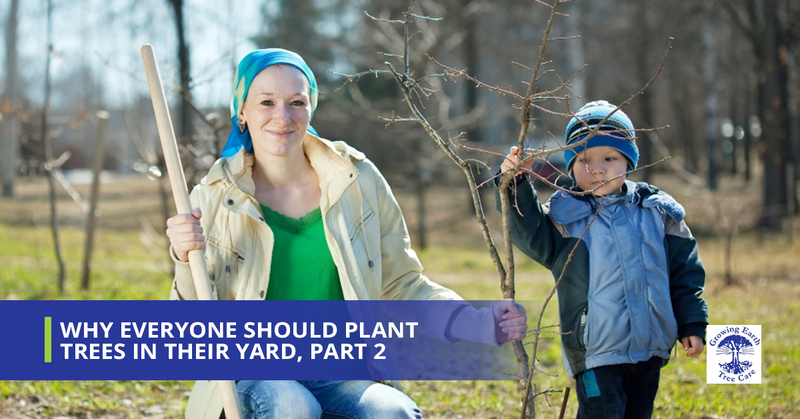 In our second installment of the two-part series entitled “Why Everyone Should Plant Trees In Their Yard”, we will continue to explore financial, environmental, and aesthetic justifications for planting and maintaining trees in your yard. Continue reading to learn why planting trees in your yard could prove beneficial for more reasons than you might have initially anticipated. It might surprise you to learn that a single tree can absorb up to forty-eight pounds of carbon dioxide in a given year. Not only that, but an individual tree can also sequester up to 1 ton of carbon dioxide by age 40. Nitrogen oxides, sulfur dioxide, ozone, and ammonia are pollutants which trees filter out of the air by trapping and holding them on their bark and leaves. The more you know! Interestingly enough, trees can actually cool a city by up to 10 degrees Fahrenheit. This is accomplished by providing homes and streets shade from the sun, disrupting urban “heat islands”, and through leaves releasing water vapor into the air. As evidence to this point, average temperatures in Los Angeles have risen 6 degrees Fahrenheit in the last 50 years as tree coverage has been reduced. Of course, many would say that global warming in general could be a contributing factor to this change, but that is a topic for another time, perhaps. Birds, possums, bees, and squirrels have the propensity to thrive in an environment with more trees. Sycamore and oak trees are just a few examples that urban species love to make their home. So if you are wanting some city-wildlife to spruce up your day, plant some trees! Skin cancer is all too common in the United States, and beyond. In fact, it is the most common type of cancer in America. It shouldn’t go unnoticed that tree coverage reduces UV-B exposure by an average of 50 percent! If you have children, this is probably reason enough to consider tree coverage for no other reason than this. We all know how much time kids like to spend outside, so why not set them up for success by helping reduce their chance of contracting skin cancer later in life, and get a beautiful yard at the same time! Perhaps you are like many of us at Growing Earth Tree Care, and grew up with abundance of homegrown fruit at the dinner table, picked the same day as consumption. There really isn’t much like being able to pick a plum or peach right off the branch, and have a chomp or two right then and there (after we cleaned it, naturally). Imagine having an ample supply of fruit every year around harvest time. Other trees, like mesquites, offer bean pods. Some are consumable by humans, but animals of all kinds will come from near and far to feast. Visualize watching wildlife graze on your bean pods while you enjoy dinner and a glass of wine from your deck. Or a glass of bean pods. Having trees in your yard can actually slow water evaporation from your thirsty lawn in need of hydration. While newly planted trees require around fifteen gallons of water (depending on the kind), they can serve as an investment. Eventually they will increase atmospheric moisture. We like this one a lot because we are pretty sure you didn’t know this one. Studies have shown that children with ADHD have exhibited fewer symptoms when they have access to nature. Other researchers give credence to the theory that patients with views of trees outside their windows have the propensity to heal both faster and with fewer complications in general. Exposure to the fresh air of nature helps people concentrate and lessen mental fatigue. Plant some trees. Once you have made the correct decision to plant trees in your yard, you will need a tree service company that knows what they are doing. You probably guessed it; it’s us at Growing Earth Tree Care. If you are looking for services which include tree removal, tree pruning, pest control, and general “tree doctor” services, we are the tree service company for you. Get in touch with your Ashburn experts today!